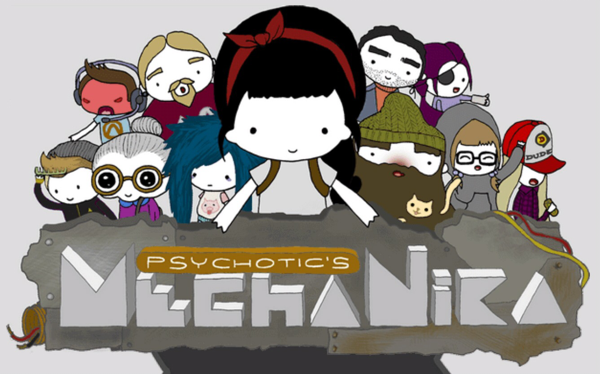 MechaNika, by Mango Protocol, is a very odd little game. It has a cutesy, hand-drawn cartoon appearance which can be misleading. 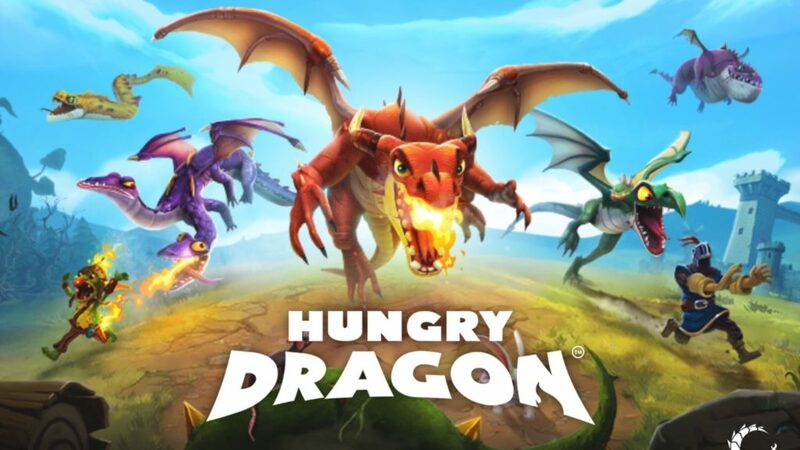 The game is packed to the brim with character, but it has a 17+ rating for good reason. 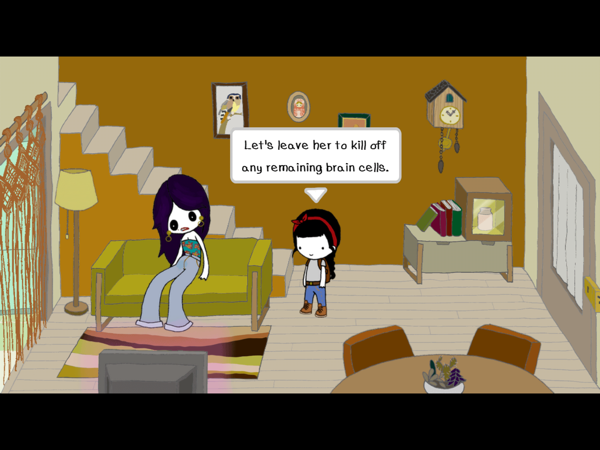 The first tip-off that there’s more to this game than meets the eye might be when Nika, the protagonist, calls her schoolteacher useless. Soon after that, she gets herself in trouble and kicked out of school. But that’s no big deal! She can just use this time to build her top-secret MechaNika project , which she will use to destroy everyone and everything she doesn’t like. You are then sent off on a quest to find all the items needed to build the MechaNika. This might involve helping a friend fix a machine or finding items to trade for what she needs. At every step of the way, Nika will encounter bothersome people who just reinforce her determination to make them all go away. You see, Nika is a smart girl who’s good at fixing things. But most people in her life treat her like a little child who shouldn’t be allowed around power tools or hard science, because they think she can’t handle it. So underneath all the dark humor is a very real and very important message. It’s refreshing to see a female protagonist that takes charge of things when everyone around her tells her she can’t. Some of those people are also about as useless as she says, too. Her mother sits in front of the TV all day, while her brother just plays video games (ahem!). 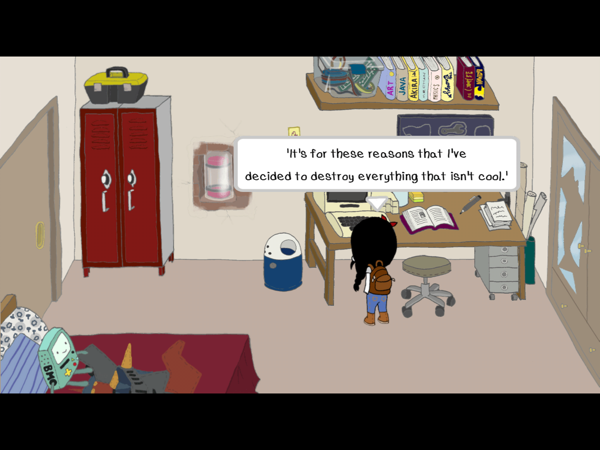 The game doesn’t shy away from quirky, over-the-top characters and dialogue. You definitely need a dark sense of humor to enjoy it, as there’s a lot more to it than just solving puzzles. It’s fairly dialogue-heavy and some puzzles require you to get information from certain characters in order to continue with the puzzle. If you don’t like reading in your point-and-click adventures, this might be a turn-off. But for everyone else, you’ll get a unique and surprising experience from MechaNika. I don’t want to give too much away, because the fun is in the discovery. As you progress on your mission, you’ll collect all sorts of items. These are stored in Nika’s backpack, which can be accessed by tapping on her head. From here, you’ll see which parts you still need to build the MechaNika, and you can try to see if any of the items you picked up will work as a part. You can also save the game from here, but it automatically saves every time you enter a new screen. If you get stuck, Nika can take a swig of her concoction of cocoa and cognac for some inspiration. The catch is, you have to be in an area where there’s still something for you to do. So you can’t really get a hint that points you to another location. It is good for making sure you’ve done everything there is to do in a room. But in certain situations, it just caused frustration, as it would tell me to do something that I couldn’t do yet. There is also a fairly large number of locations in the game, so if you’re not quite sure what you need to do, you could spend a lot of time running back and forth. There was also one instance where you have to check the same location twice, without any apparent reason for it. I’m not a fan of puzzles like that, as I wasted a lot of time trying to find some other place the item could be. These little issues were what caused me to keep taking breaks from the game instead of completing it over a couple of sittings. There are a lot of achievements, some of which are hidden. 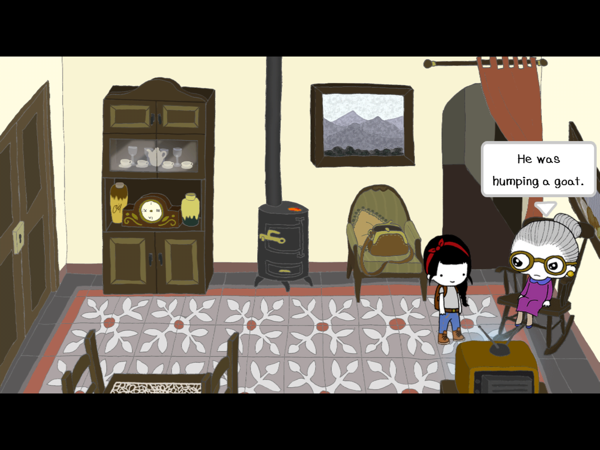 This gives you reason to explore every nook and cranny and try all dialogue options. I completed the game with a few achievements missing, so they’re not all obvious. It could give some people a reason to play through the game again to see what they missed. I did get a sense of satisfaction whenever I got a hidden achievement. I felt rewarded for taking the time to pay attention to every little thing. I played on my iPad for a more comfortable experience, but the game is not optimized for it. So while I did enjoy it more than on my iPhone, I do wish the game had been stretched to fit the screen instead of having black bars at the top and bottom. Either way, the graphics are crisp and clear and the game runs well even on my old iPhone 5. I would recommend going into the settings and changing the font, though, from script to print. It’s much easier to read and I found it gave me a much better experience. 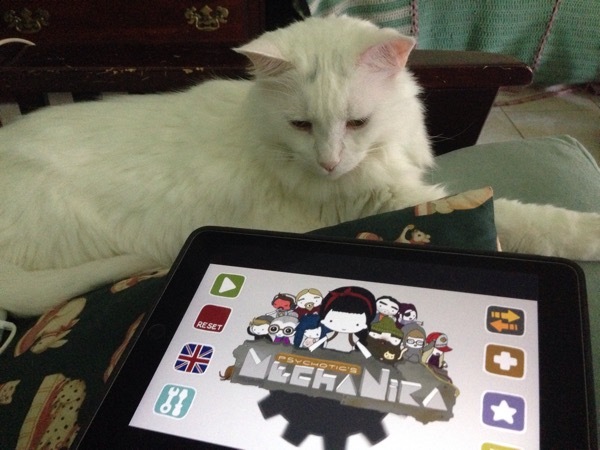 Despite a few frustrations, I enjoyed my time with MechaNika. The main character is weird but likable, and I can honestly say I’ve played nothing like it before. It’s a unique game with a twisted sense of humor that isn’t afraid of being offensive. 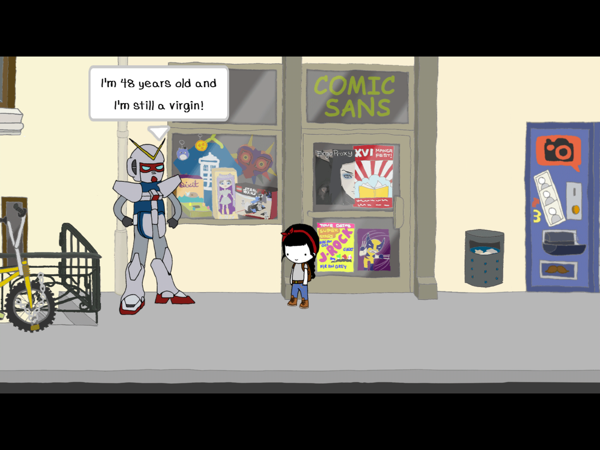 Besides adult language, you’ll also encounter some semi-pornographic prostitutes and dirty old men. So if you’d like to try something different and don’t get offended too easily, give MechaNika a try and download it here. You can also try my MechaNika walkthrough guide of you need some help.